Hi. 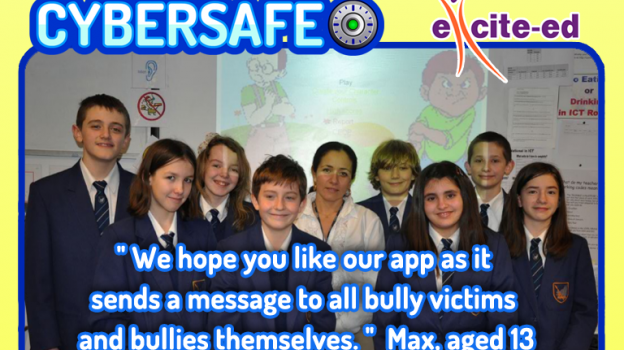 Today I want to tell you about the app Cybersafe designed and developed by children for children and funded by the Big Lottery. 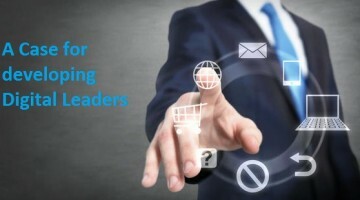 It’s available now on android and iOS at the EAS. 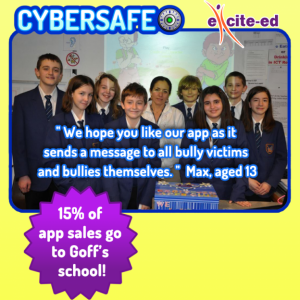 ” Excite-ed joined Goffs School Apps Club in Hertfordshire to produce the game Cybersafe, the cyberbully advice game designed by kids for kids. We designed this game not just to give kids the opportunity to have fun and socialise but also to help them if they are being bullied or are in any way at a social disadvantage. Some of the members of our Apps Club have in fact experienced forms of cyberbullying and know what it feels like to be in that position. 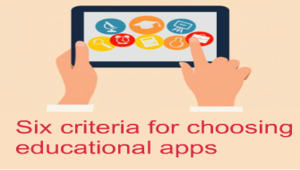 The App itself consists of three mini games which vary in type and are both enjoyable and educational.